We are proud to announce that Tuscany at Porter Ranch Community Association has selected Tinnelly Law Group as their association’s legal counsel. 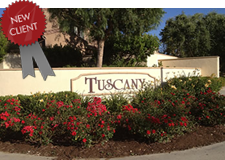 Tuscany is a private gated community in Porter Ranch which includes Cortile. It consists of single family homes ranging from 900-1600 sq. ft.
Our HOA attorneys and staff look forward to working with Tuscany’s Board and management.